Fire Safety in the long term care facility This course will prepare participants to be able to maintain proper functioning of fire extinguishers and smoke detectors. Subjects covered: Proper use and function of fire extinguishers, smoke detectors, and methods of fire prevention. Participants will properly conduct a fire drill, using emergency evacuation procedure. Maintain proper storage of combustible liquids and hazardous materials and maintain a clean and comfortable environment. Maintaining Confidentiality: This course is designed to meet the training requirements for CNA's working in the ALF & nursing, or skilled nursing homes. Subjects covered: Confidentiality preserves the privacy of the persons in your care by holding all information related to them in strict confidence for use only by the team of care providers. This includes information obtained verbally or for resident/client records. Keep yourself out of trouble by learning what information is allowed to be shared, and what information is may not. Medical Record Documentation, Observing, & Recording: This course is designed to meet the training requirement for the Florida CNA. This course covers various aspects of documentation, Observing & Recording. Subjects covered: Identify common medical errors, factors that impact their occurrence, Recognize error-prone situations, responsibility to report, safety needs of patients, education for the public to raise awareness. Preventing Accidents & Injuries: This course is designed to meet the training requirements for CNA's working in the ALF & nursing, or skilled nursing homes. Subjects covered: Identify and prevent the top 5 injuries that affect those in elder care. Course covers fire safety and the appropriate actions to take during an evacuation or drill. Proper handling of sharps, sharps containers and biohazardous waste. Personal safety measures to take to keep yourself safe both at work and away. Preventing Medical Errors: This course is designed to meet the training requirement for the Florida workers & Licensed individuals. 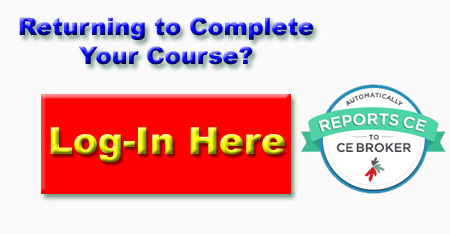 This course covers the requirements of F.S. 454-459 Laws regulating Licensed Professionals. Resident's Rights: This course is designed to meet the training requirements for CNA's working in the ALF & nursing, or skilled nursing homes. Subjects covered: The purpose of residents’ rights is to know and be informed the residents of their rights within long-term care facilities and to provide rules of ethical conduct for healthcare workers.